"Doesn't it feel great to eliminate a step in a classic recipe and have the new one turn out better? I was actually working on something I was going to call 'cheesecake souffle,' and since I was adding cream cheese to the base, I decided to skip the classic white sauce, and simply smear everything together." Brush butter on the bottom and up the sides of two 5 1/2-ounce ramekins. Scoop in some sugar; rotate ramekins to coat while pouring most of the sugar back into its container. 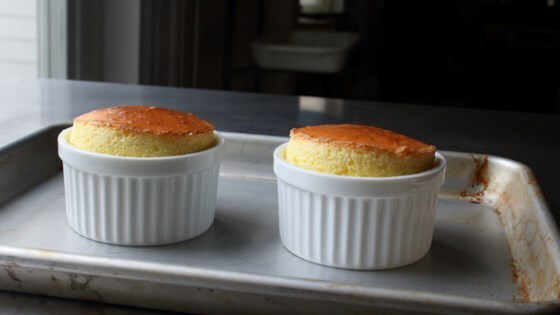 Place ramekins on a shallow baking pan. Separate eggs between 2 bowls. Add sugar, flour, 1/4 teaspoon salt, vanilla extract, lemon zest, cream cheese, and Cheddar cheese to the yolks. Mix the souffle base with a spatula until sugar and flour disappear. Sprinkle a pinch of salt over the room-temperature egg whites. Beat with a whisk until soft peaks form; peaks should hold their shape but not be stiff or dry. Stir and fold 1/2 of the egg whites into the souffle base until combined. Gently fold the rest of the egg whites into the batter. Fill ramekins up to the lip with the batter. Bake in the preheated oven until puffed and browned, about 12 minutes. Serve immediately. See how Chef John makes soufflés with this shortcut method. Reduce cooking time by 1 minute for a runny souffle, which is more traditionally French. As I mentioned in the video, despite being a very easy recipe, you will probably have to practice a few times to lock in the perfect cooking time. Variables like the oven type, ramekin size, and batter temperature will all affect the time. I love a nice sharp, aged Cheddar, but Gruyere, Gouda, and Comte would all be wonderful in this. Super easy, very tasty, great texture! I didn't have lemon but didn't miss it. The only alteration is make would be much less vanilla. It was way too overpowering. Only thing I didn't add was the lemon zest due to not having lemons and the souffles still came out great! Followed the recipe exactly and it came out beautifully. I've never had a souffle before and this was very easy to make. I will make it again and probably try different cheeses.